The lineups were split straight across the middle. If you were looking for classic country, bluegrass, and some old time legends then the Wildwood Stage was for you. The Main Stage had the mainstream up-and-comers and current mega stars on the bill. Starting off on the Wildwood Stage was another Philly Folk Fest veteran and Lancaster, PA based band, The Stray Birds. The trio brings great harmonies and a bluegrass sound. Up next were Shakey Graves. They could be classified among the new wave of Americana bands. Their new single is getting airplay on adult alternative radio like our Libra station. If you wanted the definition of a bluegrass band and needed to teach a few fellas how to work together on the mics, just watch The Del McCoury Band in action. Each of these guys can sing and pick and they move beautifully together to use the microphones in creating their sound. The legendary Oak Ridge Boys were up next. Their four part harmony is perfect, but it's their showmanship that makes the place jump. They each move around the stage and really play with the crowd, and get back to their spots right on cue. If you are going to get someone to close out the weekend on a stage that also had Lynyrd Skynyrd and Loretta Lynn you have to get some pedigree. Merle Haggard, Country Music Hall of Fame member, fits the bill. The 78-year-old is still slinging his telecaster and holding down the stage. He sounded great on his rendition of Johnny Cash's “Folsom County Blues.” Overall across the three days, the programming in the pavilion on the Wildwood Stage gave a good look at the other world of country music besides the mainstream and gave people a chance to also see some of the old country and western stars play live. The Main Stage today was set aside for fresh faces and radio stars. Michael Ray and Steven Lee Olsen were the first two acts. These guys put on good shows and had some recognizability of their singles. Charlie Worsham looked like he belonged on stage at Firefly, wasn't quite dressed the part, he even covered Walk The Moon's “Shut Up And Dance”. He put in a rocking set nonetheless. Dan + Shay had quite a few fans in the crowd. This pair is full of energy, back and forth on the stage. A fun set in the late afternoon. 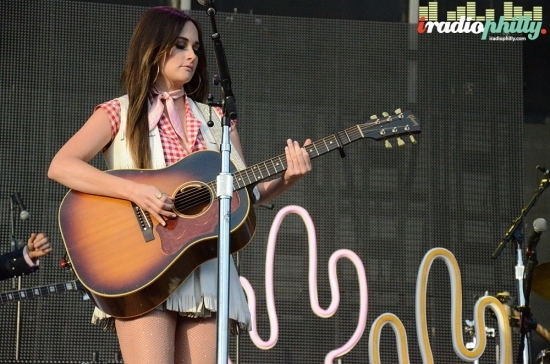 Kacey Musgraves has adopted this aesthetic on her tour ahead of her new album that is like Texas Opry Jamboree. Her band also dresses the part, and they built a set on stage to match with neon cacti. She played a good set as well. You'd recognize the songwriting turns of "Bisquits," and "Follow Your Arrow." If you ask a lot of the ladies in attendance, Jake Owen was the headliner. He is a good entertainer, sometimes with guitar, other times not, always engaging the crowd. He jumped down from the stage and got close with some fans in the front row. Later he brought some kids on stage who had a sign saying it was their first concert. He just has fun up there. Carrie Underwood closed out the night. She had a big production on stage and the crowd was excited to see her. For the third night in a row the headliner used “Somethin' Bad” by Miranda Lambert and Carrie Underwood as their intro before taking the stage. They should have sung it for each other. For the inaugural Big Barrel Country Music Festival I think this went pretty well. You can't control Mother Nature, and the organizers did a good job reacting to it. The crowds were pretty laid back, family friendly, and good natured. The lineup was terrific, good mix of big names, old names, new names, and different names. We'll see if they decide to bring it back next year.